In recent months we have written about the major changes to how litigation clients are paying for legal advice. Legal services are now being unbundled so clients can “pick and mix” when they want to pay for legal advice and when they will do it themselves. This month we will consider how unbundled legal advice fits in with representation at court hearings. This type of representation is commonly called advocacy, and traditionally it is a service that has been provided by barristers or solicitors on behalf of their clients. Following changes to the scope of legal aid funding in April 2013, there has been widespread concern that individuals will be forced to represent themselves in court (known as litigants in person). Evidence already exists that such litigants are becoming more of the norm rather than the exception, and this article considers how the courts and legal profession are adapting to a changing legal environment. For nearly 50 years, litigants in person have been able to use McKenzie Friends to provide support in court. Traditionally, this support has been provided on a voluntary basis by perhaps a family member or friend. There have also been people who charge a fee for this service. A report by the Legal Services Consumer Panel highlighted that there was an emerging market for fee-charging McKenzie Friends aiming to meet the needs of litigants who are no longer eligible for legal aid funding but cannot afford legal representation. So what exactly is a McKenzie Friend? The role of McKenzie Friends is defined in practice guidance issued by the senior judiciary (Practice Guidance: McKenzie Friends (Civil and Family Courts), July 2010). The guidance confirms that a McKenzie Friend can provide moral support, take notes, help with case papers and quietly give advice on any aspect of the conduct of the case. McKenzie Friends have no right to act as advocates (i.e. have a right of audience) or carry on the conduct of litigation. A judge may grant such rights on a case-by-case basis, but only in exceptional circumstances. The legal profession is divided on the use of McKenzie Friends. One school of thought is that this lay assistance improves access to justice. For many litigants in person, the real choice is actually between using a McKenzie Friend or being entirely unsupported – lawyers are beyond their means and free support is not available. The Legal Services Consumer Panel report suggested that cases tend to progress more smoothly when McKenzie Friends can assist the court. At a time when the court system is under strain, this is an important public interest benefit. However, another view is that McKenzie Friends may provide poor advice that harms their client and third parties, offer little in the way of consumer protection, prey on the vulnerable and exploit litigants. In the Law Society’s recent guidance on unbundled legal services, they provided some suggestions on how law firms might deal with the rising use of McKenzie Friends. In brief, the suggestions boiled down to “If you cannot beat them, join them”. Firms, it was suggested, could provide a professional McKenzie Friend service as an alternative to traditional advocacy. This might be done by a suitably trained paralegal who could provide this service at a more modest fee compared with the cost of providing advocacy at a hearing. With suitable training there is no reason why a highly capable and willing Legal Secretary would not be able to provide this type of service. Fee-charging McKenzie Friends have now become a legitimate and recognised feature of an evolving legal services market. If this is something that you are interested in, you should look out for the consumer guide on McKenzie Friends which is due to be published by Law for Life in the near future. If you are particularly keen, then you could contact the Personal Support Unit (PSU) and see about becoming a volunteer. 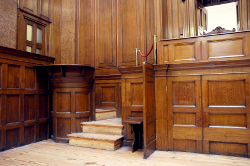 If you have attended the Royal Courts of Justice visit organised by the Institute, you have come across one of the PSU’s offices in the main court building. This charity’s vision is that every person in England and Wales attending civil and family courts or tribunals alone should have access to a PSU volunteer. In 2013, over 300 volunteers assisted more than 19,000 litigants, an increase of 54%. By 2016 it is planning to help 30,000 clients a year by expanding the services it offers in existing PSUs and opening many more. The number of family cases, especially dealing with contact and care of children, trebled in 2013 and went from 27% to 42% of the caseload. Other clients are involved in cases relating to financial difficulties, including housing, debt, bankruptcy and small claims. PSUs are concentrated in major cities across England and Wales. Clients are often multiply disadvantaged through unemployment, serious health problems (often mental health), a disability, and literacy or language issues. The PSU volunteers do not give legal advice, but can support by listening to clients tell the story of what has happened so far as well as what their current worries are; prompting clients to order their thoughts; tidying paperwork into a rational order and indexing it; helping clients find out which forms they need to fill in, complete them if they know what they want to say, and take the paperwork to the appropriate customer service desk or court office; helping people find their way around court or tribunal buildings and offices; assisting in discussions with court or tribunal staff; going into court or tribunal hearings with clients and sitting by their side; and alerting clients to free legal advice or representation, or to means for accessing relevant advice online.